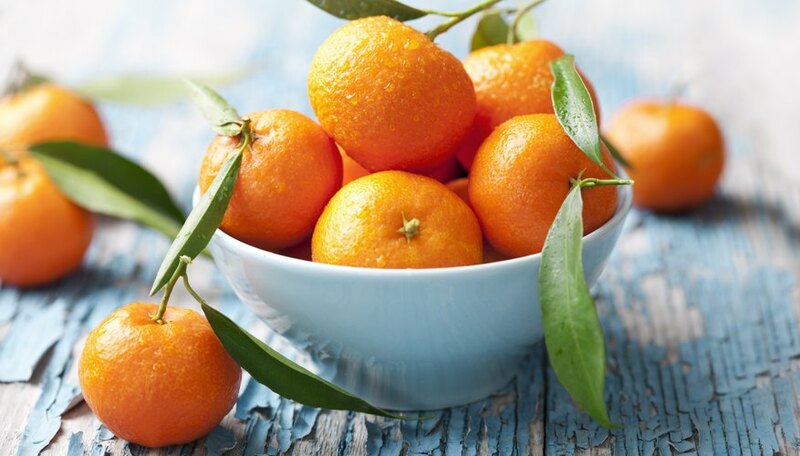 The cheerful colors and bright, bold flavors of citrus fruits make them easy to love. Laying in a large supply when prices are good -- or during harvest, if you live in a citrus-friendly climate -- offers a pragmatic way to enjoy them more often. It also raises the question of how to store your citrus fruit, so you can enjoy them over an extended period rather than watching them deteriorate and decay. For your day-to-day use, it's perfectly fine to keep a portion of your trove of citrus out at room temperature. The colorful fruits lend a festive appearance and delicate perfume to the room, and your oranges will be more aromatic and flavorful at this temperature. A shallow bowl -- or even better, a mesh basket -- is a good choice for storing and displaying your citrus, allowing decent air circulation to deter moisture buildup and mold. Don't stack them too high, or their own weight will bruise and damage the fruit on bottom. Most citrus fruits remain good for a week or more at room temperature. For fruit you won't use during the initial several days, your refrigerator is the best storage place. Commercial handlers keep citrus at temperatures of 38 to 48 degrees Fahrenheit, somewhat higher than refrigerator temperatures, and at high humidity. Your home fridge is cooler and dryer, with its crisper drawers coming closest to providing the right environment. Store as much of your citrus as you can in the drawers. You can extend the fruits' refrigerator life by wrapping them individually in paper towels, which inhibits the moisture buildup that leads to mold and spoilage. Expect them to keep well for three to four weeks. To enjoy your citrus over even longer periods, you'll need to take more drastic action. Slices, wedges or -- best of all -- membrane-free segments can be frozen or canned in syrup, for long-term enjoyment. Juice and peel can also be frozen, for drinking and baking. The peel and sliced fruit can also be dehydrated in your oven or in a food dehydrator, concentrating their flavors and extending their storage life to months or even years. You can also candy citrus fruit and peel, or preserved them in the form of jam or marmalade. Choose citrus fruit that are heavy for their size -- and therefore juicy -- and without visible blemishes. If you buy them in a bag or box, sort them carefully when you get home. Any flawed fruit, with blemishes on the skin, damage at the stem end or flattened places where they're bruised, should be set aside to use first. Wash the fruit under cold running water, using a brush if necessary to remove visible soil, before you set them out for casual eating or process them for storage. Citrus fruit haven't been noted for food-borne illness, but like any other kind of produce they can be exposed to unpleasant substances in the course of normal handling.